Objective: It is well known that a brief exposure to 100% oxygen for only a few minutes could be toxic for a preterm infant. The effectiveness of neonatal resuscitation was compared with low concentration oxygen (30%) and high concentration oxygen (HOG) (100%). Methods: Thirty-two preterm neonates were born in Isfahan Shahid Beheshti hospital with gestational age of 29-34 weeks who required resuscitation were randomized into two groups. The resuscitation was begun with 30% O 2 in low concentration oxygen group (LOG). The infants were examined every 60-90 seconds and if their HR was less than 100, 10% was added to the previous FIO 2 (fraction of inspired oxygen) until the HR increased to 100 and SO 2 (saturation of oxygen) increased to 85%. In HOG resuscitation begun with 100% O 2 and every 60-90 seconds, FIO 2 was decreased 10 - 15% until the HR reached to 100 and SO 2 reached to 85%. Findings: The FIO 2 in LOG was increased stepwise to 45% and in HOG was reduced to 42.1% to reach stable oxygen saturation more than 85% at the fifth minute in both groups. At the first and third minutes after birth and there was no significant differences between groups in heart rate and after 1,2,4 and 5 minutes after the birth there was also no significant differences in SO 2 between groups, regardless of the initial FIO 2 . Conclusion: We can safely initiate resuscitation of preterm infants with a low FIO 2 (approximately 30%) oxygen and then oxygen should be adjusted with the neonates needs. About 5-10% of neonates who are born require some degree of resuscitation at the birth time. The American Academy of Pediatrics (AAP) recommended resuscitating the infants at the birth time by the use of 100% oxygen. It was shown in 1960s that the amount of hypoxanthenes during the fetal hypoxia and hypoxia after the birth are increased in the baby's blood and other body tissues. At the end of the 1970s, the studies showed that if the baby exposed to reoxygenation (especially high concentrated oxygen) at the time of conversion of hypoxanthenes to xanthenes, the production rate of oxygen-free radicals is increased. Oxygen-free radicals can cause tissue destruction. In addition, the production of H 2 O 2 in the brain leukocytes increased following the usage of 100% oxygen in the resuscitation of infants suffering from asphyxia. This entry was introduced in the 1930s, as the "oxygen paradox" in particular after a period of severe hypoxia or ischemia. Using 100% oxygen will activate tissue damage. Oxidative stress has damaging effects on the growth of the cells and facilitates them to death. It also has significant effect on the prognosis of the infants. In addition, the pure oxygen in the delivery room can cause oxidative stress and induced damage to DNA and problems for the children in the future, including the incidence of acute lymphocytic lymphoma (ALL). Several reports of increased retinopathy of prematurity (ROP) also published after the exposure to oxygen. Moreover, the relationship between ROP and pure oxygen has been well proven. However, as time passes, good progress has been made in the treatment of ROP, but today, it has been occurred as the third epidemic especially in developing countries. This disease could be the cause of these items: Amblyopia, strabismus and even complete blindness in severe cases. Accordingly the studies were performed gradually in order to compare 21% oxygen of RA (Room air) rather than 100% oxygen and the results were released. Saugstad showed that the mortality of term infants who received 21% oxygen during the recovery time at the birth was much less than the babies who received 100% oxygen. The recovery time also reduced in these infants and the time to the first breath was shorter. Heart rate (HR) in the 90 seconds after the birth and the fifth minute Apgar score in the RA oxygen group were better than the 100% oxygen group. Other studies also showed that the time to the first breath and first crying in babies were revived with 21% oxygen were shorter. , The important findings of other studies have indicated that the RA oxygen can be effective as the 100% oxygen in the resuscitation of term and preterm neonatal and may be even better. For example, the time interval until the first breath and crying of the baby reduced in the RA group (compared with 100% oxygen). In addition, the duration of required ventilation with the positive pressure is reduced. Neonatal resuscitation with 21% and 100% oxygen were compared in a retrospective study. The first minute Apgar score in 21% oxygen group was higher but the difference was not obvious in the fifth minute Apgar score. It was higher even at 21% oxygen group. No difference was observed in the HR between the two groups. The time to the first breath and the first crying was also shorter. It appeared that the environmental chemoreceptors sensitive to the blood oxygen level are more suppressed in infants revived with 100% oxygen and the respiratory efforts might be delayed. The collected data from different studies indicated the reducing mortality in the cases of using RA oxygen. In a meta-analysis which has conducted by Rabi and colleagues was shown that the mortality (in the first week and the first month of age) in the preterm and term infants (with 21% oxygen) was much lower. The occurred severe hypoxic ischemic encephalopathy (Grade II and III), was identical in both groups. According to the mentioned studies and many other studies, it seems that the use of 100% oxygen is followed by tissue destruction and toxic effects such as occurring ROP, ALL, chronic lung disease (CLD) and increased mortality. Thus, reducing the exposure to oxygen (during the resuscitation) is very important. For this reason, the researchers have concluded that it would be better to start the resuscitation of term and preterm infants with RA oxygen. As well as there are very few studies on the amount of required oxygen in the resuscitation of premature neonates for the adaptation with the environment with lower production of oxidative stress, oxygen-free radicals and tissue destruction. ,,,,,, Although the new studies are rapidly being conducted. 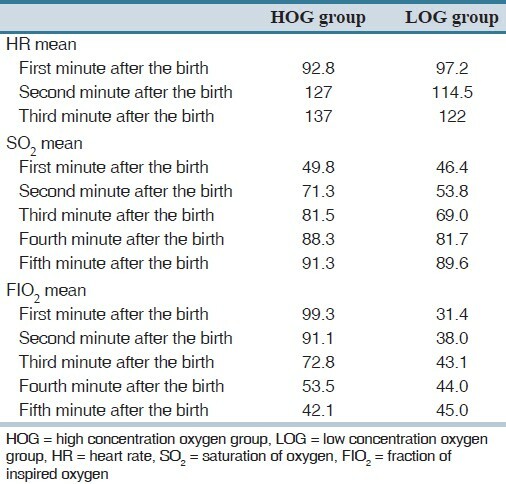 Due to the disadvantages of pure oxygen (which is routinely used in neonatal resuscitation), this study was performed with the aim of comparing the results of neonatal resuscitation with lower gestational age (GA; 29-34 weeks) in the two groups of high oxygen group (HOG) and low oxygen group (LOG). This clinical trial was conducted in newborns with a GA of 29 to 34 weeks, who required resuscitation at the birth time. The infants were divided into two groups of resuscitation with pure oxygen (HOG) and with low oxygen (LOG) with FIO 2 (fraction of inspired oxygen) of 30%. The inclusion criteria were: GA of 29-34 weeks and the need for resuscitation (HR < 100 or cyanosis) at the birth and the exclusion criteria of the study were: Major congenital anomalies, the need for chest compressions during resuscitation, endotracheal intubation and no need for resuscitation at the birth time. The study was done in Shahid Beheshti University Hospital in 2009 - 2010 affiliated to Isfahan University of Medical Sciences, Isfahan (Iran). We received ethics committee agreement and then start the work. Written consent was obtained from parents too. The record sheet for resuscitation of the baby was taken to the delivery room by the neonate reviver. The observed events were recorded in this sheet. The required FIO 2 for the beginning of the resuscitation and also its increase or decrease based on the baby's condition was given by the blender. For the both groups of the neonates, PPV or continuous positive airway pressure (CPAP with about 5-6 cm H 2 O by neo-puff device) were used. The concentration of oxygen was measured with oxygen analyzer moment by moment. Both groups of the infants after the delivery were placed under the radiant warmer in the first 30 seconds. After drying and if required, two slow tactile stimulations ( that were given in the area around the spine of the baby for the stimulate spontaneous breathings) the pulse oximetry was attached to them and they were monitored. The resuscitation was initiated if the HR was below 100 or apnea or if HR > 100 and no apnea but persistent cyanosis continued. At first in both groups, oxygen (according to the desired concentration of high or low) was given for 10 seconds. Positive-pressure ventilation and oxygen (according to the desired concentration) were started in the case of no satisfactory response and spontaneous breathing. The resuscitation was started with 30% of FIO 2 in the LOG group. The baby was checked every 60-90 seconds. If the HR was below 100, then 10% was added to the previous FIO 2 . Adding to the previous FIO 2 was repeated until reaching the HR more than 100 pulses per minute and SO 2 (oxygen saturation) more than 85%. The operation was started with 100% of FIO 2 in the HOG group. The babie's conditions were checked every 60-90 seconds. The time for reaching the HR more than 100 and SO 2 to more than 85% were recorded. In the case of reaching to more than 85% of SO 2 , 10-15% was reduced from the previous FIO 2 . These cases were also recorded. Finally, after gathering the information from the two groups of the infants, the following cases were compared: Time to reach to more than 85% of SO 2 , HR >100 and the required FIO 2 to achieve the goals. The results were compared with the χ2 test and Fisher's exact test. The data was analyzed by using the SPSS statistical software version 15. 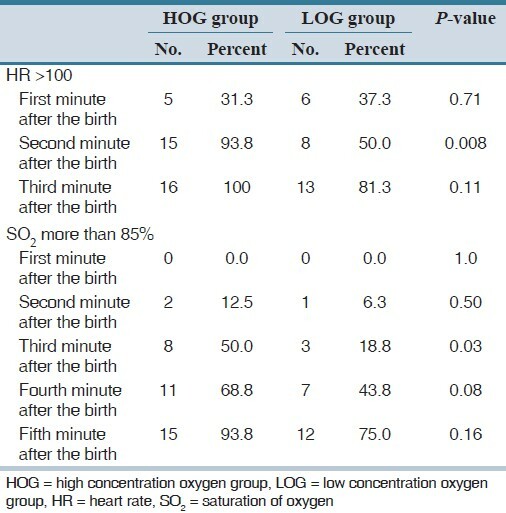 Sixteen premature infants in the LOG group (30% oxygen) and 16 premature infants in HOG group (100% oxygen) were studied. The mean age of the fetus in the LOG and HOG groups were 32 and 30.8 weeks, respectively. There was no significant difference in this regard. The Mean birth weight of the newborns was 1700 g and 1600 g in the LOG and HOG groups, respectively. There was no significant difference in this case too. Based on our results, there was no significant difference in the frequency of HR >100 in the first and third minutes of the birth in the two groups. There was no significant difference in the frequency of cases more than 85% of the amount of SO 2 (SO 2 >85%) in the first, second, fourth and the fifth minutes of the birth in the two groups [Table 1]. The percentage of oxygen concentration (FIO 2 ) was gradually increased in the LOG group, if needed. The mean of SO 2 was reached to above 85% in the fifth minute of birth in the LOG group [Table 2]. Accordingly, the mean required FIO 2 in the fifth minute of birth was reached to about 45%. FIO 2 was gradually decreased in HOG group. FIO 2 mean was reached to 42.1% in the fifth minute of the birth and the mean of SO 2 came above 85% in the fourth minute. The mean HR in both groups was reached to above 100 pulses in the second minute of the birth. Nomortality rate (in early infancy) was observed in both groups. The survey results showed that the low oxygen concentration can be effective the same as high concentration oxygen in the resuscitation of premature infants. Due to the destructive effects of pure oxygen (100%) in premature infants, it is proposed to start the resuscitation with about 30% of FIO 2 after the attachment of the pulse oximeter and if needed, it can be adjusted by the baby's oxygen saturation of arterial blood. In a clinical study by Wang and colleagues, the resuscitations of 41 infants with GA from 23 to 32 weeks were compared in the two groups of 100% pure oxygen and RA oxygen. All newborns in the RA group needed to some degree of increasing the oxygen. Some of them required to increase the oxygen concentration up to 100% purity. The amount of SO 2 (obviously) was lower in the RA group from the second to tenth minute after the birth, but the HR, the incidence of intraventricular hemorrhage (IVH), ROP, necrotizing enter colitis (NEC) and CLD did not differ in the two groups. Finally, it was concluded that the 21% oxygen should not be used for the resuscitation of the infants with GA of less than 32 weeks. Twenty-one percent oxygen was not used in our study too. The initial resuscitation was launched with 30% FIO 2 . This item could be the reason of differences in our results. Rabi and colleagues in 2011 showed that Titrating from an initial oxygen concentration of 100% was more effective than giving a static concentration of 100% oxygen in maintaining preterm infants in a target oxygen saturation range. Initiating resuscitation with 21% oxygen resulted in a high treatment-failure rate. This item could be the reason of differences in our results too. In July 2006, the Royal Victoria Women Hospital in Australia was changed its policy. It was proposed to use room air instead of 100% oxygen during neonatal resuscitation in delivery room. Accordingly, a cohort study was performed in this regard. In that study, the infants less than 30 weeks in both RA and HOG groups underwent resuscitation and compared. About 85% of the infants in the RA group in the minute of 2.5 of the birth required the oxygen support (for resuscitation). The mean SO 2 in the second minute the birth was 25 percent). Finally, it was suggested that the pulse oximetry should be attached to the baby (during the initial resuscitation) in the delivery room. The needed support oxygen should be administered to the infants with low GA. In our study, the pulse oximeter had been attached to the leg of the baby and the blood oxygen saturation was monitored moment by moment. In our study, the primary oxygen of about 30% was used for the start of resuscitation. There was no significant difference in the frequency of HR >100 in the third minute of the birth. The mean HR was above 100 pulses in the second minute of the birth in both groups. There was not significant difference in the frequency of SO 2 more than 85% in the fifth minute of the birth in both groups. This subject was in line with the above study. Thirty-two premature neonates were studied in our study. The small number of infants in our study was a limitation. But the direct supervision of infants by a specialized resident of neonatology for the resuscitation of all the infants may be considered as the strong point of this study. Low concentration oxygen seems to be effective the same as the high concentration oxygen in premature resuscitation. Due to the destructive effects of pure oxygen on premature infants, it is proposed to start the resuscitation of the premature babies with FIO 2 30% after attaching the pulse oximeter and if necessary, it could be adjusted due to the neonate's blood SO 2 . Both authors contributed the idea of research, design of study, data analysis and manuscript preparation. 1. Robertson NJ. Air or 100% oxygen for asphyxiated babies? Time to decide. Crit Care 2005;9:128-30. 2. Saugstad OD. Room air resuscitation-two decades of neonatal research. Early Hum Dev 2005;81:111-6. 3. Saugstad OD, Aasen AO. Plasma hypoxanthine levels as a prognostic aid of tissue hypoxia. Eur Surg Res 1980;12:123-9. 4. Kutzsche S, Ilves P, Kirkeby OJ, Saugstad OD. Hydrogen peroxide production in leukocytes during cerebral hypoxia and reoxygenation with 100% or 21% oxygen in newborn piglets. Pediatr Res 2001;49:834-42. 5. LATHAM F. The oxygen paradox. Experiments on the effects of oxygen in human anoxia. Lancet 1951;1:77-81. 6. Saugstad OD. Oxygen Toxicity at Birth: The pieces are put together. Pediatr Res 2003;54:789. 7. Naumburg E, Bellocco R, Cnattingius S, Jonzon A, Ekbom A. Supplementary oxygen and risk of childhood lymphatic leukaemia. Acta Paediatr 2002;91:1328-33. 8. Vento M, Asensi M, Sastre J, Garcia-Sala F, Vina J. Six years of experience with the use of room air for the resuscitation of asphyxiated newly born term infants. Biol Neonate 2001;79:261-7. 9. Ramji S, Rasaily R, Mishra PK, Narang A, Jayam S, Kapoor AN, et al. Resuscitation of asphyxiated newborns with room air or 100% oxygen at birth: A multi-centric clinical trial. Indian Pediatr 2003;40:510-7. 10. Martin RJ, Bookatz GB, Gelfand SL, Sastre J, Arduini A, Aguar M, et al. Consequences of neonatal resuscitation with supplemental oxygen. Semin Perinatol 2008;32:355-66. 11. Davis PG, Tan A, O'Donnell CP, Schulze A. Resuscitation of newborn infants with 100% oxygen or air: A systematic review and metaanalysis. Lancet 2004;364:1329-33. 12. Rabi Y, Rabi D, Yee W. Room air resuscitation of the depressed newborn: A systematic review and meta-analysis. Resuscitation 2007;72:353-63. 13. Saugstad OD. Optimal oxygenation at birth and in the neonatal period. Neonatology 2007;91:319-22. 14. Rabi Y, Singhal N, Nettel-Aguirre A, Room-Air versus oxygen administration for resuscitation of preterm infants. Pediatrics 2011;128:e374-81. 15. Dawson J, Vento M, Finer N, Rich W, Saugstad O, Morley CJ, et al. Managing oxygen therapy during delivery room stabilization of preterm infants. J Pediatr 2012;160:158-61. 16. Mosca F, Colnaghi. M Delivery room intensive care unit. Minerva Pediatr 2010;62:15-6. 17. Vento M. Tailoring oxygen needs of extremely low birth weight infants in the delivery room. Neonatology 2011;99:342-8. 18. Saugstad OD, Aune D. In search of the optimal oxygen saturation for extremely low birth weight infants: A systematic review and meta-analysis. Neonatology 2011;100:1-8. 19. Wang CL, Anderson C, Leone TA, Rich W, Govindaswami B, Finer NN. Resuscitation of preterm neonates by using room air or 100% oxygen. Pediatrics 2008;121:1083-9. 20. Dawson JA, Kamlin CO, Wong C, te Pas AB, O'Donnell CP, Donath SM, et al. Oxygen saturation and heart rate during delivery room resuscitation of infants <30 weeks gestation with air or 100% oxygen. Arch Dis Child Fetal Neonatal Ed 2009;94:F87-91. 21. Escrig R, Arruza L, Izquierdo I, Villar G, Saenz P, Gimeno A, et al. Achievement of targeted saturation values in extremely low GA neonates resuscitated with low or high oxygen concentrations: A prospective, randomized trial. Pediatrics 2008;121:875-81.